AVS Forum | Home Theater Discussions And Reviews > News Forum > Latest Industry News > Is OLED Burn-In a Big Problem? Is OLED Burn-In a Big Problem? While OLED TVs are able to produce impressive imagery, a susceptibility to image burn-in has caused a lot of debate. Here’s an overview of the situation. [email protected] and Starstryke like this. Also I am at incheon International airport in Seoul and looking at numerous LG OLED TV's that are installed here as advertisements, playing news and TV 24/7. Granted who knows when these TVs get to have a compensation cycle implemented, but the lesson is... if you do not take care, trouble lurks. They all show clear signs of IR at the minimum but also almost certainly burn in, that is easily seen and photographed. It is interesting to say the least since these TVs are labeled as being "powered by LG Display"
Pitbull0669 and srkmish like this. Last edited by imagic; 11-17-2018 at 04:05 PM. And what about the Samsung QLED, Q9FN to be exact? barrelbelly and srkmish like this. There are also QLEDs in the terminal and as you would expect zero signs of IR or burn-in. Which mirrors what rings saw. Also worth mentioning, the OLED TV's are not playing the same contents, there are probably dozens of them in the terminal and they are playing different channels but they clearly suffer from problems. Q9FN should have the same resistance to burn-in as other QLEDs. barrelbelly, Pitbull0669 and srkmish like this. Last edited by imagic; 11-17-2018 at 04:11 PM. And I totally, I am at incheon International airport in Seoul and looking at numerous LG OLED TV's that are installed here as advertisements, playing news and TV 24/7. They all show clear signs of IR at the minimum but also almost certainly burn in, that is easily seen and photographed. 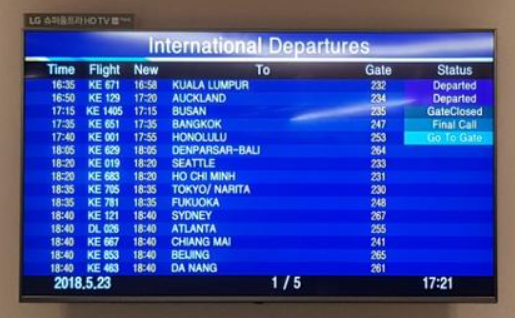 There was a thread started a while back about one of those OLEDs at the Incheon Airport (photo) which had burn in (based upon the zdnet article), that thread was joined with a OLED burn in thread so your info in post #2 cannot be added. Anyway it would be nice if you share some picks. LG OLED 2018 model burn in at Incheon Airport. LG replaced that model with a LCD. I'll add that link to this article, and when I got home I can put some photos in this thread. One slight issue is the lack of Internet in the flight. 12 hours of total cutoff! But replacing that one TV? Lol. There are plenty of OLEDs with big issues here in the airport right now and not just a static display of departures. My video clips are easily showing "holy crap' obvious issues on TVs showing a variety of programming. Last edited by imagic; 11-17-2018 at 04:36 PM. I still have a first gen 1080P LG OLED and have owned several other OLEDs since. brentsg, Mashie Saldana, gerry_allen and 6 others like this. Its unfortunate how these networks always have there logo displayed. Anything static is probably a bad thing . Anthem AVM60 , Anthem MCA525 . Panasonic DP-UB820 UHD player . Last edited by MajorTendonitis; 01-09-2019 at 01:00 PM. I just had a conversation in a Facebook group about OLED burn-in. Some guy was arguing with me that it wasn't an issue and linked the Rtings article where they tested an LG OLED vs two different types of LCD displays. And in the article it showed that after a number of hours, the OLED had permanent burn-in but both LCD's had no damage whatsoever. I thanked the guy for proving my point. Needless to say he wasn't happy. Let that be a lesson. Read the articles you are linking to prove your point before posting them. LOL! I have 2 OLED tv's. First one is a 65EF9500, with over 4500 hours. OLED light is set to 100, and contrast at 85 for over 4000 hours. Most watching sports with logos and banners. No BI. My second tv is a 65E6 OLED with over 2000 hours. Again, no BI. It is completely being overblown. Real world use, real world no BI. brentsg, Mashie Saldana, Travisx2112 and 5 others like this. Last edited by wxman; 11-17-2018 at 08:57 PM. So what you are really saying is that it's still a bad time to buy any new TV. DigitalGriffin, newfmp3, Markalark and 1 others like this. There are LCDs that look great, maybe not right at the level of OLEDs, but top-tier LCDs can get very close. I had a rear-projection CRT TV that developed burn-in (most notably lines at 4:3 and 2.35:1 aspect ratio borders on the 16:9 screen) and avoided plasma because the burn-in on my TV bugged me and I didn't want to invest in another TV where it would be a problem. That was also a reason I decided to go LCD over OLED (also being able to get a much larger size for similar money to a smaller OLED). MicroLED can't come soon enough, assuming that will be free from burn-in concerns. brazen1 and Jonas2 like this. Yep, no airport living for me either...course I'm watching a 7 year old Panny PLASMA with zero burn in so what do I know about avoiding burn in. These articles are a little one sided...they forgot to include the risks associated with watching an LCD...mainly crappy contrast/blacks and worse viewing-angle...chance of that happening=100%. LCDs public relations lobby must be really well funded, they've already killed one superior technology (plasma) and now they're gunning for a second...all the while still sporting their same old tired technology (the money for the lobby must come from the tons of money they're saving in R&D by never innovating) HA! 4K with a plasma would have been a massive power hog. Then there are energy regulations that really killed plasma. I feel "airport screens" are completely offtopic on a forum like this. Those are in no way representative of normal use of a TV bought by an audiovideo enthusiast. The risk of burn in exists. But it existed for plasma too. That hasn't stopped me from using my Kuro for more than nine years now, with pretty much zero burn in problems. No way I would settle for guaranteed lower quality picture in the name of a *risk*. Certainty vs. risk. I know what to choose. brentsg, wilbur_the_goose, OGauge4Me and 4 others like this. Yes the burn in mongering was a concerted effort by the lcd PR lobby to take down plasma, and it worked to an extent. Now the same is being tried against oled , if you go to social media sites, they jump onto such negative articles to convince themselves and others how they should never buy oled. From someone who has used oled in a home environment for over a year (airport public display is not representative at all of home use), i would say of all the reasons you might cough up of trying to avoid oled, burn in risk should be right at the bottom of your list. the risk of permanent burn in on oled with normal home use is much less than plasma, which itself affected less than 10% total users. I own a z9d too beside oled, in a dark room environment, the z9d doesnt come to oled, with lights on it can look closer. watch pacific rim 4k uhd in a dark room and you'll see why z9d is much behind. and burn in risks are all overstated, see i have been using oled as my primary monitor to hook up my pc since many months. brentsg, gerry_allen, Markalark and 1 others like this. Both my OLED TV's are ISF calibrated to 120cd/m2 light output. No problems what so ever. There's no reason to ever go over 120cd/m2 unless you want to watch your TV with a welding mask on. Sure, as long as you watch in a dimmed room and only SDR content. 200 nits SDR on a TV calibrated for daylight viewing looks great. brazen1, srkmish and BattleAxeVR like this. Last edited by imagic; 11-18-2018 at 06:56 AM. LG itself told ratings, which right now is showing that the issue is real, that it varies by panel so one person's experience may not be the same as another's especially with viewing habits in the mix. plonk, HD KOOL-AID and srkmish like this. Well, an airport full of LG OLEDs installed this year and they are all basically ruined and showing extremely severe issues is not totally off topic. But yeah those panels are likely maxed out and running all day, so torture test. The simple fact there are also an equal number of completely fine LCDs in the airport must mean something g to someone, even if it means little or nothing to you. Well anyhow obviously people who have OLEDs but do not have issues get upset when the very real and proven issues that affect some people are discussed. They should simply click away and go read something more relaxing since it does not impact them. brazen1, prplhaz123 and srkmish like this. rtings does not run tests the same way i watch different content on oled at home, so rtings tests are not pointing out that the risk is real in practical usage scenario. Apparently the risk is real enough for 7 percent of AVS members who took the poll to report it happening to them. The evidence it is an issue at this point comes from many directions, not just one test or example. Last edited by imagic; 11-18-2018 at 09:09 PM. Apparently the risk is real enough for 16 percent of AVS members who took the poll to report it happening to them. lol anyone can hit a yes button on a forum even if they did not own an oled, and the sample size on a forum poll is telling nothing. Yeah, that's why the other evidence matters. Not just the poll. Now if someone owns their own OLED that has no burn in, it's all the evidence they need. But dismissing others reported issues? brazen1, Pitbull0669, prplhaz123 and 2 others like this. Last edited by imagic; 11-18-2018 at 07:19 AM. I do not have an OLED. I own and still use a plasma screen. Anybody running an airport and choosing OLED screens as terminal screens is simply incompetent. It's not more complicated than this. What I meant is that airport use has seriously nothing in common with domestic use. Just that. It's not that I get upset, it's more that I've already seen plasma being attacked for years on this subject and if that's not been the only reason that made the technology disappear, it surely has contributed. Has the AV world been better off because of it? I'd say no, considering that Kuros remained the reference point for... what it was? Four years after their demise? I'd hate for history repeating itself with OLED, just that. smitty, newfmp3, gajCA and 3 others like this. As Buck-Naked stated, a properly calibrated TV in a somewhat light-controlled environment (as in the sun isn't blasting onto the screen) and using such recommendations as those by the THX company, should have a light output around 35fLs (or, to use more modern parlance, 120 nits). Is this significantly darker than the general public assumes is correct? Definitely. But does this put us close to what the director/cinematographer/colorist, etc. intended. Absolutely. It's simply a matter of getting used to it, rewiring our brains. Give those people who love "pop" a couple weeks with a properly calibrated TV and they'll grudgingly get used to it, even admit it looks better. I remember plasma getting slammed for a similar burn-in argument, which was definitely one of the reasons it failed and inferior LED tech thrived. Let's not let that happen with the superior OLED tech. 3) don't watch so much damn 24-hour news (MSNBC, CNN, FOX) with all those annoying chyrons and news tickers. Not only will it be better for your TV, it'll be good for your brain too. (24-hr news will invariably turn your brain into extreme left/extreme right mush. The world would be a much better place if we all hovered more towards the middle. harobikes, MajorTendonitis and Starstryke like this. Well, context is needed. Samsung and LG have their TVs in the airport, mounted n Kiosks that advertise the brand and the tech (OLED vs. QLED) so it's not as if these are airport displays for arrival and departure bought by the airport. and that 'evidence' is not evident of mixed usage in a practical scenario, so im not paying heed to it, i never run ad loops or news channels more than a hour in one viewing session. Calibration to 100-120 nits assumes a dark room, just as movie theaters are dark. Running ISF 120-nit in a living room TV you watch with lights on or during the day looks better with more brightness and yes the calibration still matters as it will lock in the gamma and color. But.nobody should be grudgingly admitting that a TV that's too dim for the ambient environment looks better than a brighter TV because it is not true. And again that all completely ignores HDR. Pitbull0669, harobikes, srkmish and 2 others like this.